Story: Iznogoud is the Grand Vizier of Baghdad who tries to become the Caliph instead of the Caliph. Background notes: Iznogoud is one of the examples on series, where a supporting character takes over as the lead. 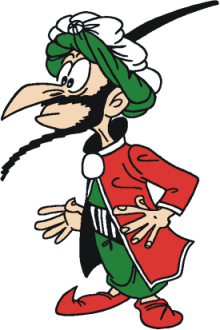 When Iznogoud and his helper Dilath Larath first appeared in Record #1 in 1962, the Calip Haroun El Poussah was the main character and the series was named Calife Haroun el Poussah. With his insane plans and temper tantrums when things went wrong, Iznogoud became the main attraction of the series, and when the series moved from Record to Pilote in 1968, the series started changing name to Iznogoud. The change came gradually and Haroun El Poussah appeared in the headline as late as 1972. Iznogoud ran in Pilote until 1977, when Goscinny died. After Pilote, the series took a break until 1986, with a single appearance in Circus #35 in 1981, when it went to Vaillant et Pif and BoDoï, where the last record so far is from 2005. Like the other successful series from anthologies like Pilote and Spirou, the stories were collected in albums and are still in print. With the death of Goscinny, Tabary took over as writer, and the stories about Iznogoud changed, going from short stories, usually 8 pages, to full length album stories. So far, 27 albums have been published. The basic story in Iznogoud is the Grand Vizier, who wants to be Calip instead of the Caliph (Calife a la place du Calife). For this he tries all sorts of approaches, like getting the Caliph changed into a frog or gold statue, hypnotized into believing he is a donkey or trapped somewhere. The stories often involves or contains references to modern day products like computers, deodorants etc. and time travel where they meet the writer and artist also happen. Like Wile E. Coyote's contraptions from ACME, Iznogoud's plans and contraptions/magical items always backfires, and Iznogoud always end up the victim of his own plan and Caliph Haroun El Poussah never discovers that Iznogoud has tried to have him removed. One of the remarkable things about the series, is that Iznogoud is one of the first anti-heroes to appear and gain fame. The popularity of anti-heroes in comics we know today did not start until the mid to late 1980s. A big part of the explanation is presumably the sharp satirical whit and puns from Goscinny, but also the slapstick violence instead of the realistic violence seen with anti-heroes like Diabolique, making it appealing to both children and grown-ups, an approach that was also used in Asterix with exactly the same effect. Being so popular and graphic in its nature, Iznogoud has been transferred to other media. The most obvious is cartoons. This happened in 1995, when eight episodes were made (Iznogoud's voice by Michaël Youn). The episodes were recreations of stories from the comics. In the wake of the comics to moved trend currently seen, Iznogoud was also made into a live action movie in 2005, with Michaël Youn playing Iznogoud. Iznogoud was also one of the comic book characters to be transferred to computer games when the media was still relatively new. The first game was Iznogoud from Inforgrames and was released for the platforms Amstrad CPC, PC/DOS, Atari ST, and Commodore 64. A second game was released in 1998 for PC and Play Station.